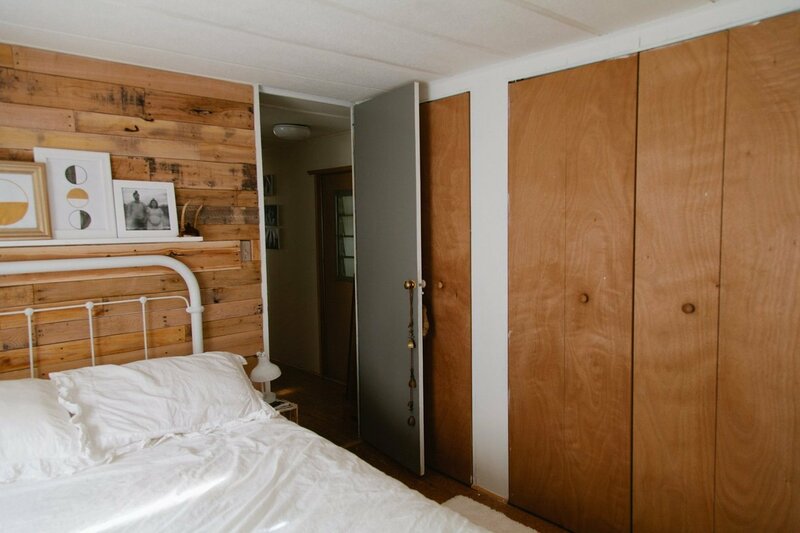 This cool couple figured out our secret and created a stylish Scandinavian eclectic mobile home. Tiny homes are trendy. People love the idea of living in a more affordable and smaller home that sheds the typical American attitude toward materialism and debt. They want a home that doesn’t require they work 70 hours a week and gives them the opportunity to travel and pursue hobbies. Mobile home owners have been doing that very thing for 80 years now. I love when writers use the terms like ‘unconventional’ and ‘thinking out of the box’ to describe mobile homes. Almost 20 million Americans live in mobile homes – it’s not unconventional or out of the box. Still, the fact that Apartment Therapy showcased this Scandinavian eclectic mobile home is promising – factory-built homes really are making headlines. This Scandinavian eclectic mobile home is unconventional but not because it’s a mobile home, it’s just real people living in real homes with real budgets. It is unconventional because it is a beautifully decorated home that says a lot about the owners and what is and isn’t important to them. These mobile home owners are stress-free and debt-free. 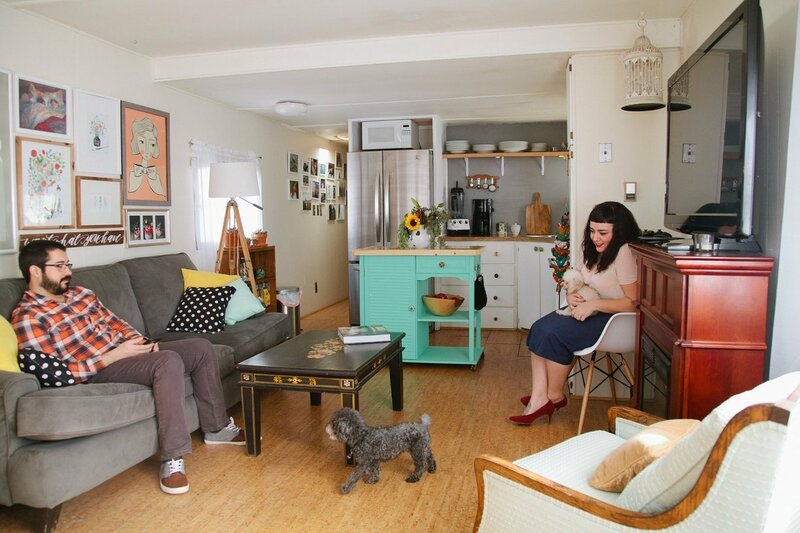 When Apartment Therapy features a single wide mobile home you know it’s gotta be special! Rebecca Caridad Facteau and her husband Dustin live in Boulder, Colorado. They have lived in the 750 sq. foot single wide for 3.5 years and what they’ve managed to do with it is inspiring. It’s personalized from top to bottom and end to end! Dustin is a chemist and Rebecca is a photographer and calligraphy artist. 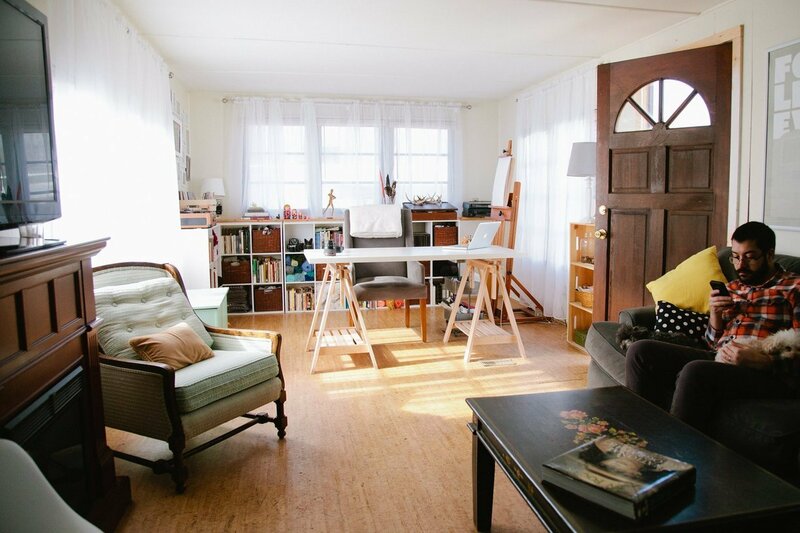 Their Scandinavian eclectic mobile home serves as both home and studio for her and it is a great place to let her creativity and her ink flow. 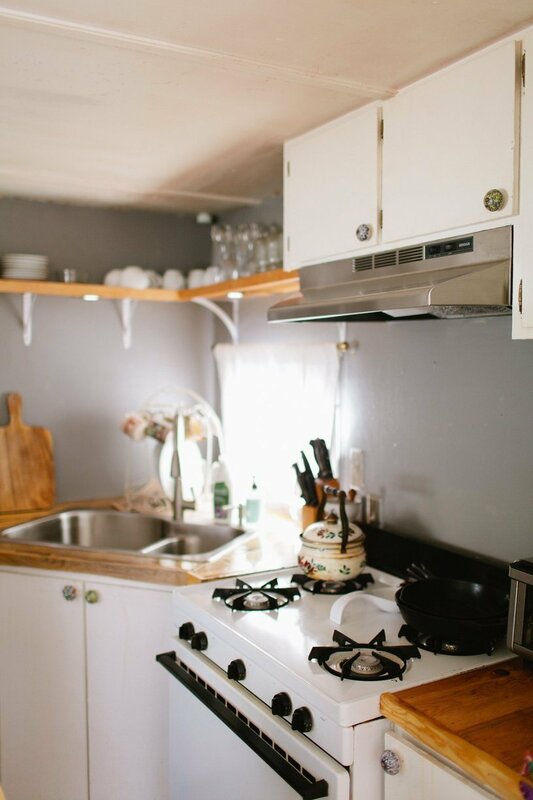 The couple’s decision to buy a mobile home was centered around two common desires: to not be tied down by a huge mortgage and to be able to spend their money and their time as they pleased instead of working to pay for a home they wouldn’t be able to enjoy. After years of spending money on rentals that never quite felt like home, Rebecca and Dustin set out to find something to call their own without breaking the bank, in hopes of avoiding a life centered around paying down a massive 15-30 year mortgage. See another modern single wide mobile home remodel. 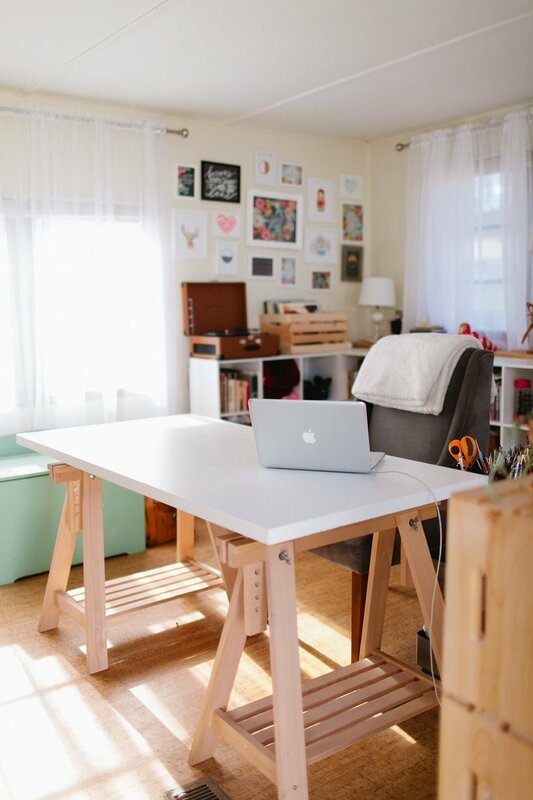 A workhorse of a space – this is a great place for working. 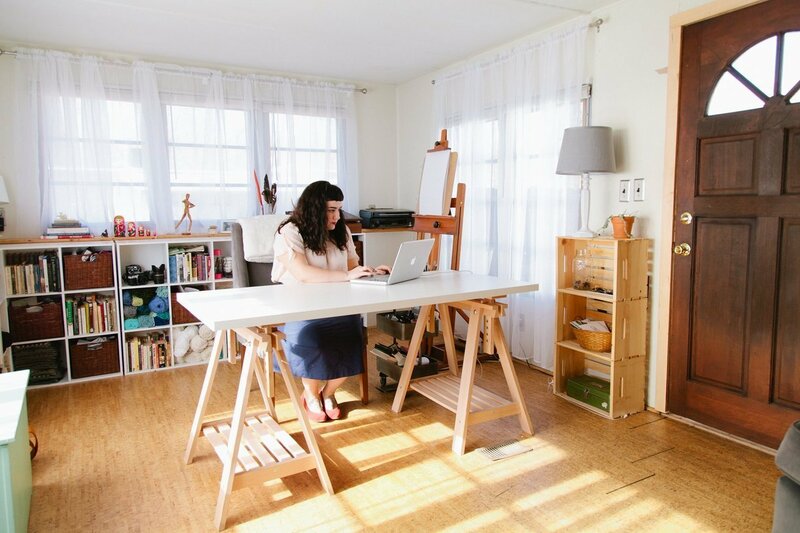 Simple cube storage helps the home double as both a living space and a work space. 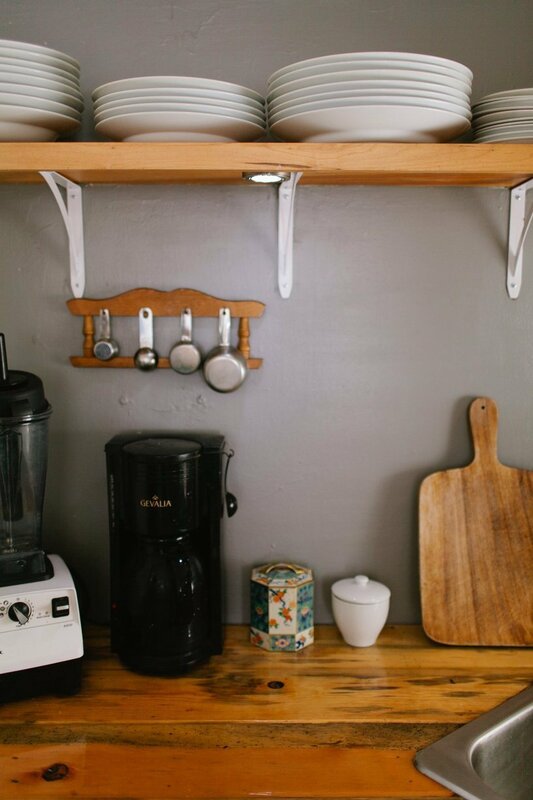 Read about other smart storage solutions for small homes. 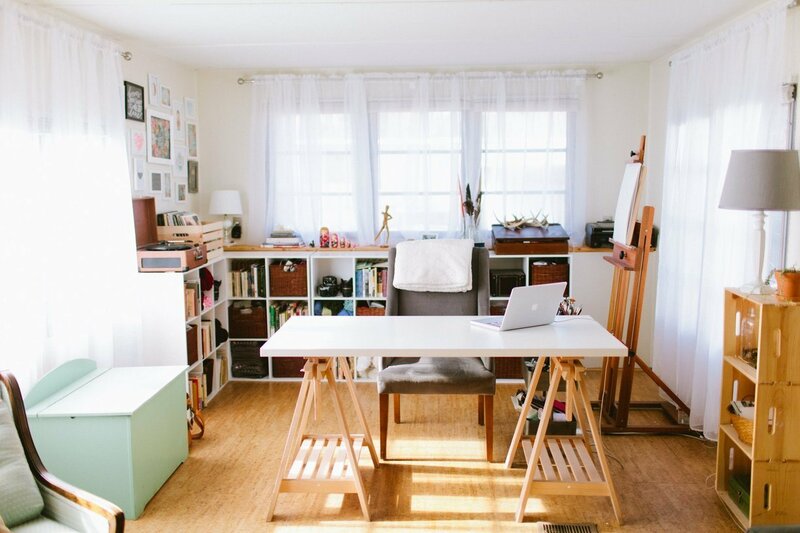 A perfect space for creative work. They found a single wide mobile home in a mobile home park just 10 minutes from town. 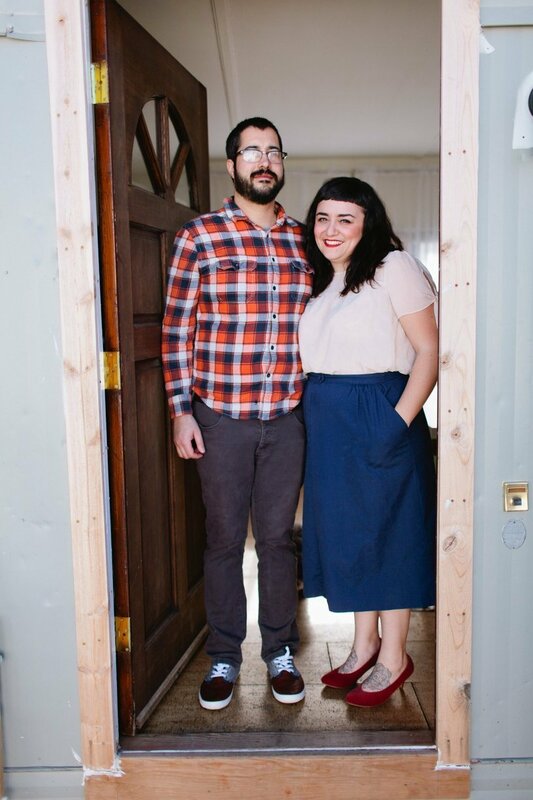 Rebecca and Dustin have created a gorgeous home at a fraction of the cost most people pay. This home probably looked rough when the couple first bought it, which is something all of us living debt-free that opted to purchase a very affordable used manufactured home can relate to. Hip, retro, and Scandinavian modern are probably the best adjectives to describe this mobile home decor. In the photo above you can see the beetle kill countertop. Beetle Kill refers to the mountain pine beetle epidemic taking over the forests. The beetle lays eggs right under the bark which kills the tree and gives the wood a blue hue. It is a very environmentally friendly material that is still as strong as an undamaged tree. 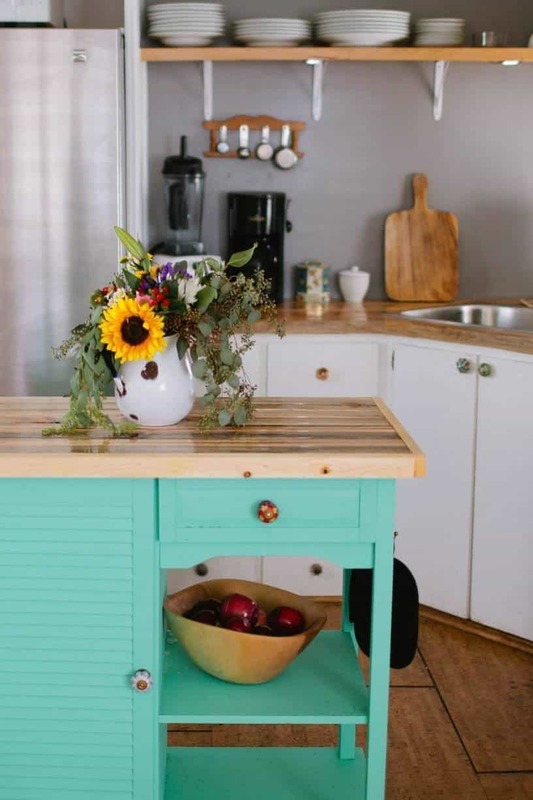 A gorgeous splash of color on the kitchen island adds a dramatic effect to the space. 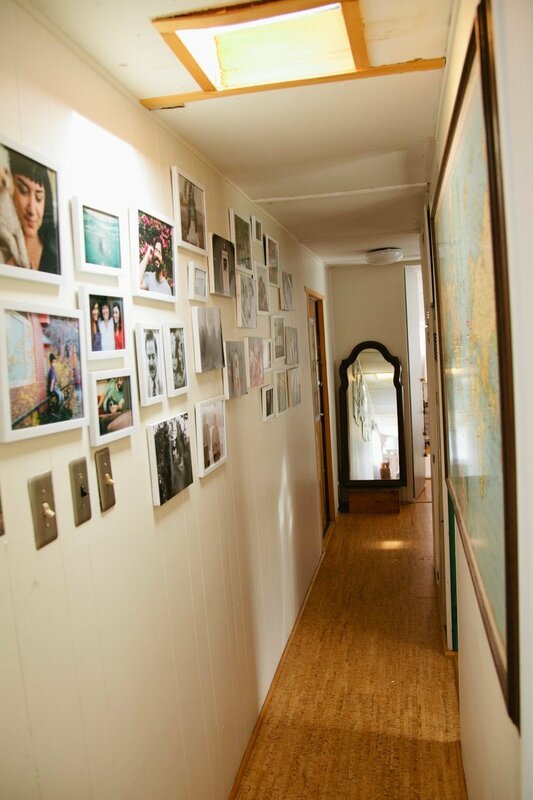 The hallway is the couple’s personal art gallery. Images and personal tokens line the space from one end to the other. The master bedroom is our favorite space in the home. 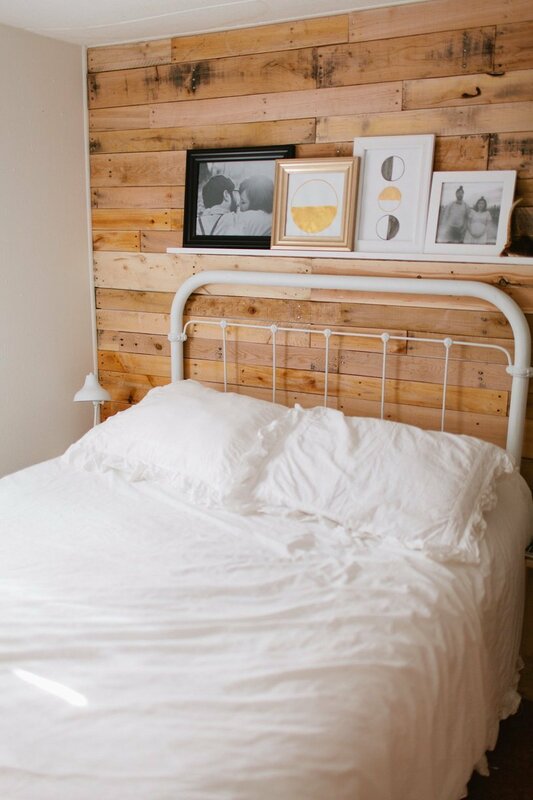 The DIY shiplap wall adds rustic texture makes for a simple sleeping space. The white ceilings and walls help bounce light around the space in the mornings. 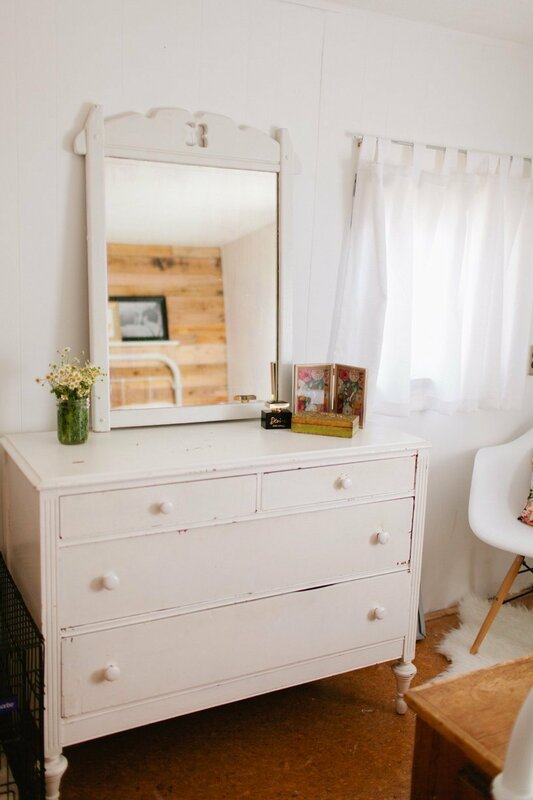 Shiplap doesn’t have to be perfect and it shouldn’t be – the whole point of this popular design trend is to add a natural element to a space. 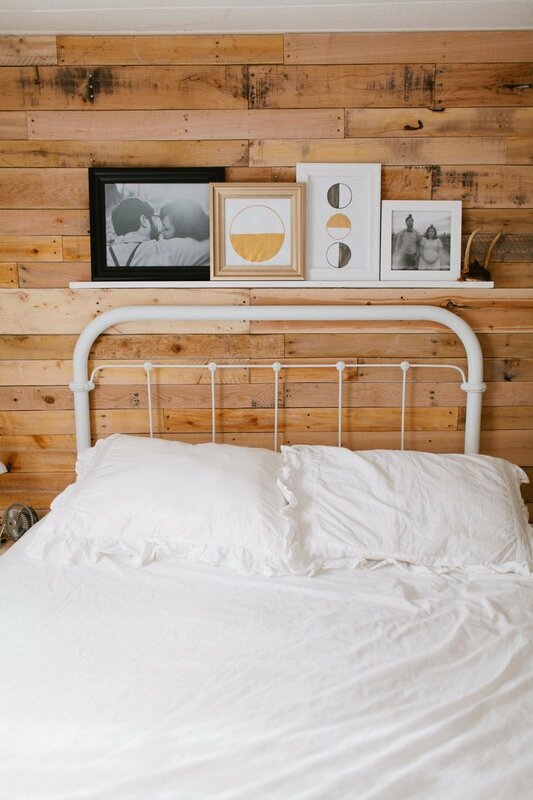 Update your own mobile home bedroom with these 4 Pinterest ideas we love. 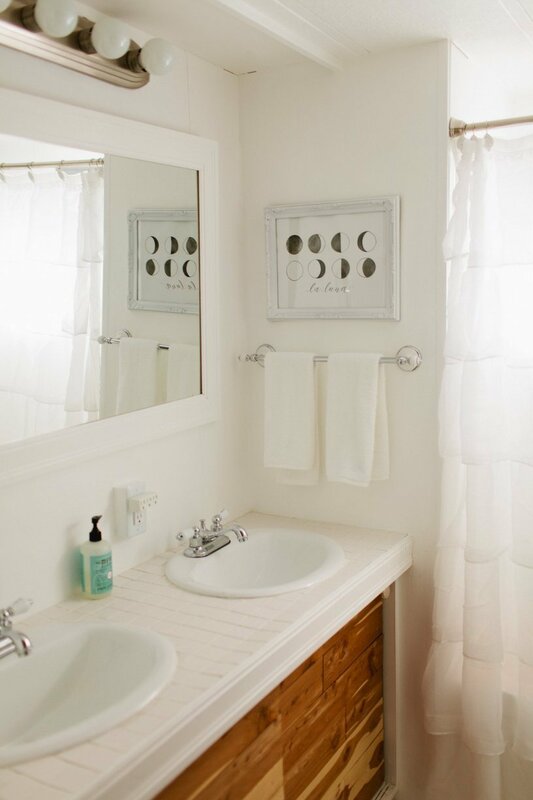 The bathroom is a perfect place to start your day. 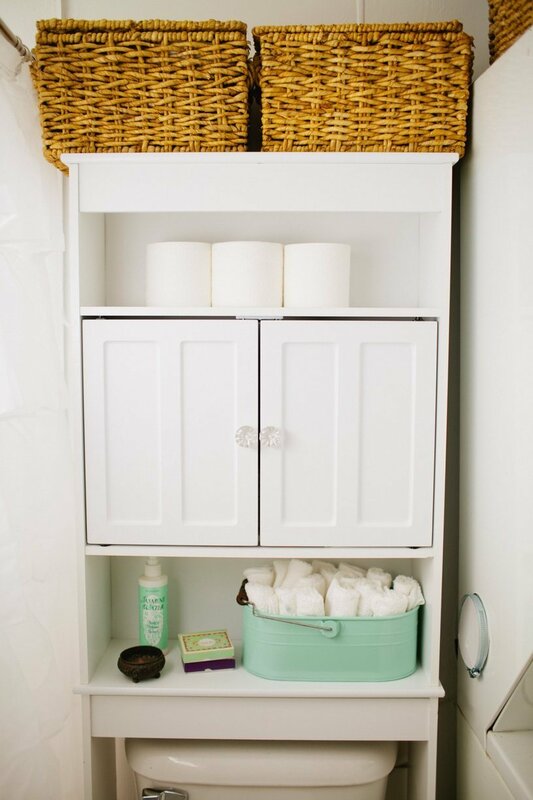 Organizing small spaces is easy with the right storage. Over-the-toilet shelving units can be bought for less than $100. Inspiration: Small space tours and articles on blogs and websites. 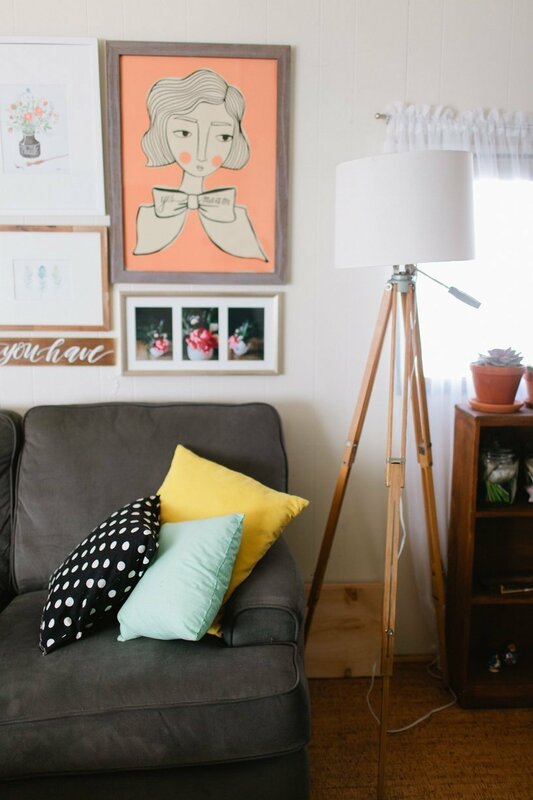 It is really easy for things to look cluttered quickly in small spaces. Even if there is just one thing out of place or one too many things, it can feel overwhelming. 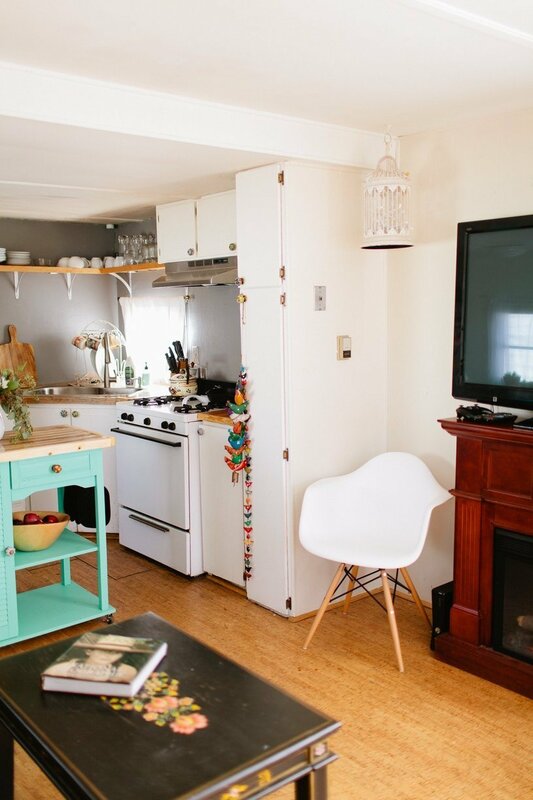 Favorite Element: Our favorite element is how affordable we get to live in Boulder, CO. Also, small spaces inspire you to be minimal, which we love. I think it emphasizes what is important. Biggest Challenge: The hardest thing for us is that we have so many plans for our space. But, we don’t have enough money or time for them right now. We are learning patience with our home projects. One thing at a time! 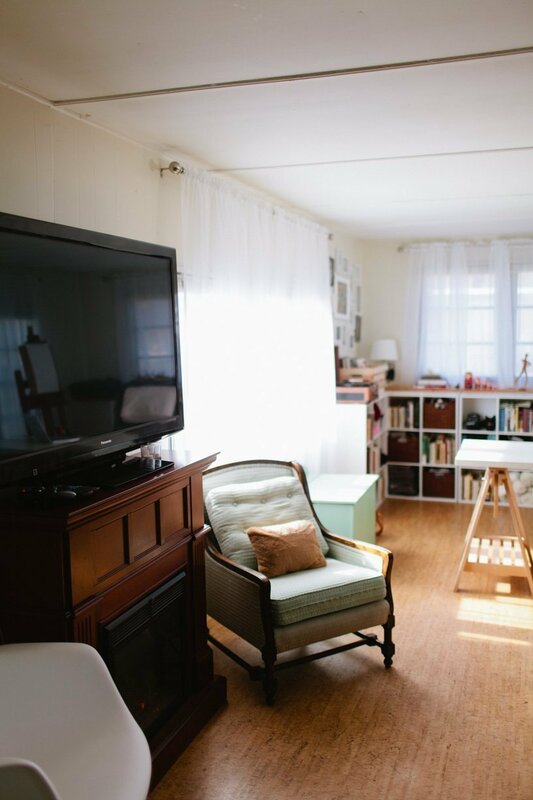 What Friends Say: Our friends say that they feel like the space is a nice reflection of us and our everyday style. People definitely seem surprised with what we have done to a trailer. I think there is still quite a taboo when it comes to mobile homes. 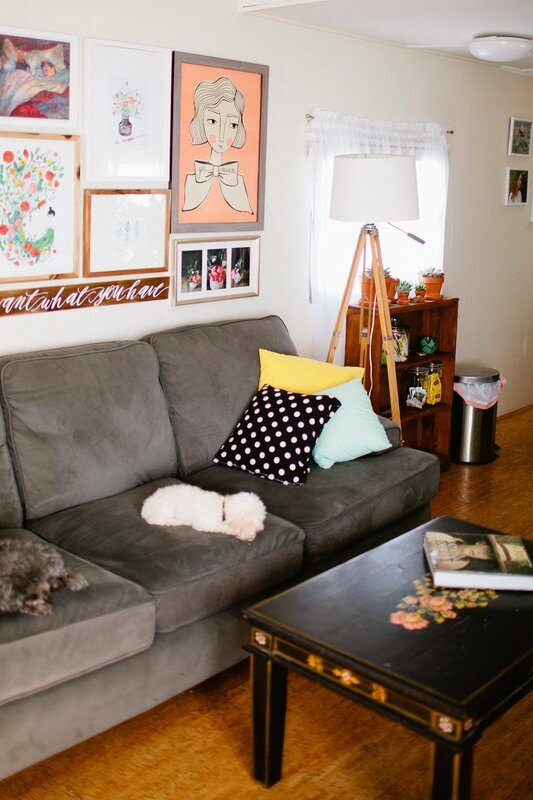 I hope that goes away because any space can be made beautiful and homey. Biggest Embarrassment: I would say our windows and our flooring. Cork floor is really pretty, but it is really soft and sadly we have pretty much destroyed it since we’ve lived here. The windows and floors are our biggest projects that we want to do, and they probably bother us more than anything else. 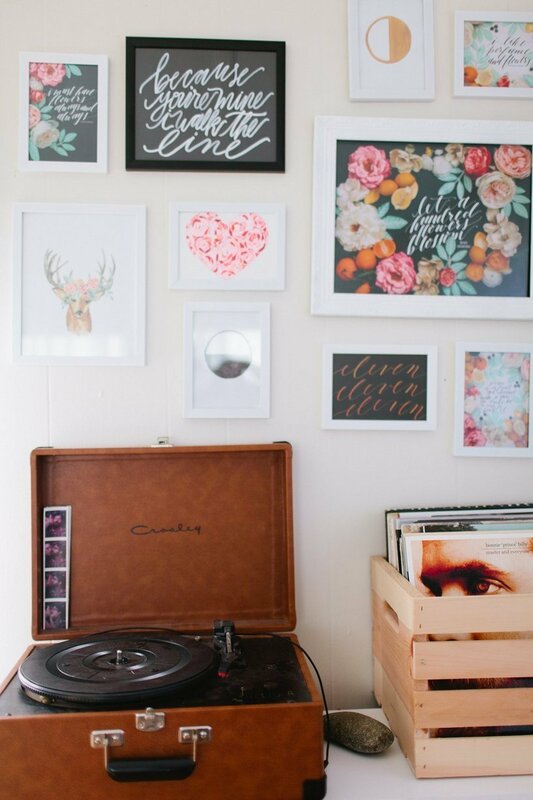 Proudest DIY: We have so many! Probably our proudest is our recent pallet wall project. We also really love our beetle kill pine counters in the kitchen. Biggest Indulgence: Definitely our refrigerator. The one that was here was the original fridge that was included in the home when it was built. We knew that had to be our first big investment. Best Advice: After trying to do a lot at once we realized that doing one project at a time worked a lot better for our sanity. 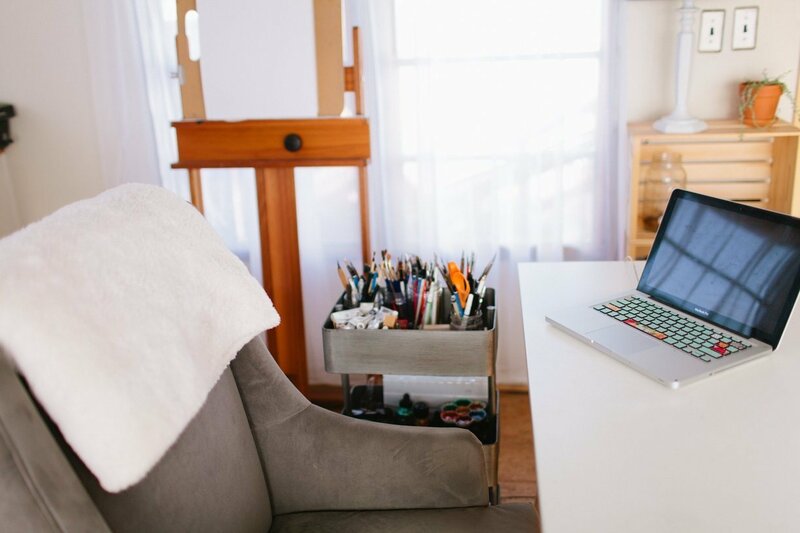 I think it is important to have at least one part of your space sort of “put together,” so when the part you are working on is crazy you have somewhere to escape to when you need a break. 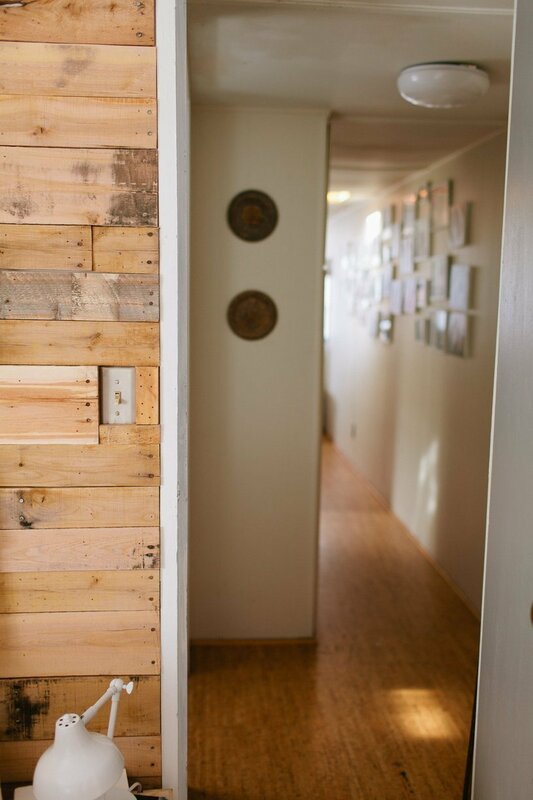 You can read and see more about this gorgeous Scandinavian eclectic mobile home on Apartment Therapy. Re-designs that could make a big punch. I love that bedroom and bathroom SO MUCH! Well done, my friends. Just perfect! Love every detail and Rebecca put a lot of thought into every single detail! Two questions: did she create her own Prosperity Hens and where did she get the jadeite washcloth holder above the toilet? Very good advice; do one project at a time and be patient. I love the art work it makes the home theirs. Painting the kitchen white lightened the whole house ! 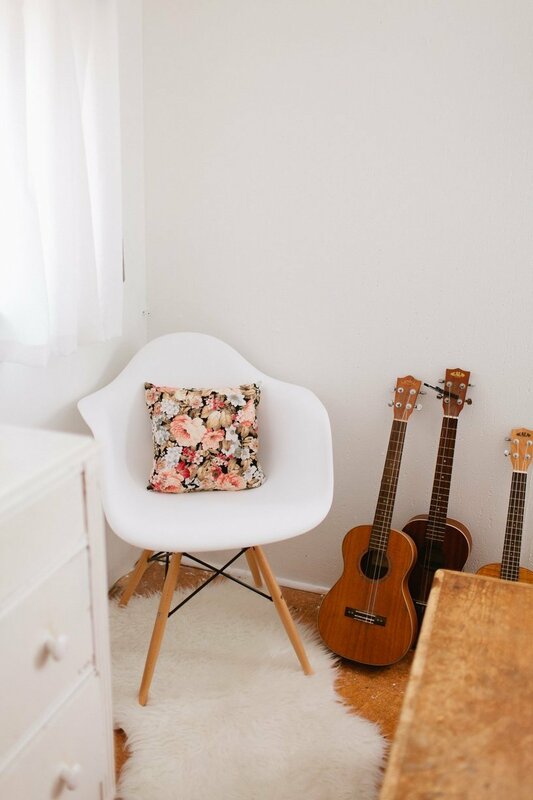 The touches of mid-century furnishing fits in just right. They look so organized which is a must in small spaces. The use of glass jars with the spring tops I’m going to steal ! Awesome use of space, very trendy and I can see the option of a more affordable and smaller footprint being attractive to younger people.